Home >Services >What Is A Periodontist? A periodontist is a dental specialist who treats gum and periodontal disease. From the office of your Lawrenceville, NJ periodontists, Dr. John Lu and Dr. Raul Figueroa at Lawrenceville Dental Implant Center And Periodontics, here is some information on what periodontists can help you with. You should see a Lawrenceville periodontist for conditions that are too severe to be treated in a general dentist’s office, such as severe periodontal disease. You will also benefit from the skills and expertise of a periodontist if you have a condition requiring surgery of your gums or bone. To learn if you have gum disease and to protect your smile from developing it, contact Dr. John Lu and Dr. Raul Figueroa at Lawrenceville Dental Implant Center And Periodontics, your Lawrenceville, NJ periodontists, at (609)896-0700 today! 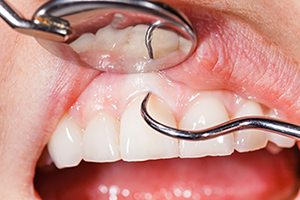 Do you think that you need to see a Periodontist? Call our Lawrenceville, NJ office today at (609) 896-0700 and appointment!